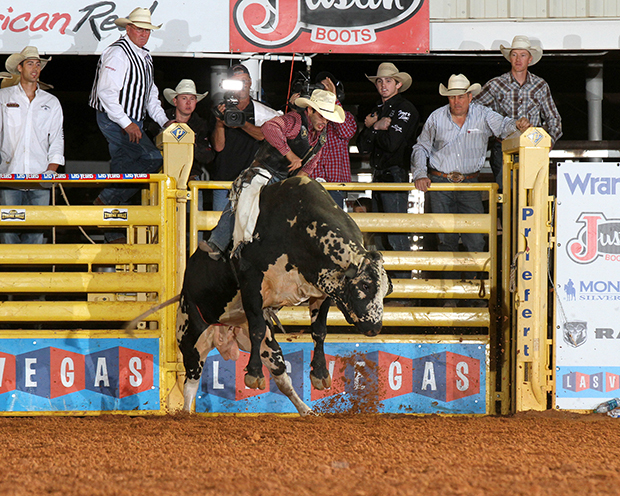 LOVINGTON, N.M. – Having momentum in any sport is vital to success, and Tim Bingham is in the middle of a hot streak. On Tuesday night, Bingham dominated the Lea County Xtreme Bulls at Jake McClure Arena, winning both go-rounds and the coveted title. He also pocketed $11,577. Bingham was just a week removed from his Division 2 victory in Dodge City, Kan., when he arrived in Lovington. It showed from his first ride, when he made moves to match every challenge he faced in Salt River Rodeo’s Lucky Dawg for 89.5 points to win the first round; he finished just a point ahead of Chris Roundy of Spanish Fork, Utah. In the championship round, Bingham made major adjustments thrown at him by Pete Carr Pro Rodeo’s Lineman for an event-best 91 points. The “well” is the inner portion of a bull’s spin, and the G-forces tend to pull cowboys off in a bad position. Bingham battled through it to stay atop the tough-to-ride bull. It is working quite well, and the Utah cowboy is a virtual lock to make it to the Wrangler National Finals Rodeo for the first time – only the top 15 contestants in each event at the end of the regular season qualify for the year-end championship. So is the streak Bingham has been on over this season. First round: 1. Tim Bingham, 89.5 points on Salt River Rodeo’s Lucky Dog, $3,405; 2. Chris Roundy, 89, $2,611; 3. (tie) Cole Echols and Brennon Eldred, 87.5, $1,589 each; 5. J.W. Harrison, 85, $795; 6. (tie) Jordan Spears and Corey Navarre, 82, $511 each; 8. Ardie Maier, 81, $341. Final round: 1. Tim Bingham, 91 points on Pete Carr Pro Rodeo’s Lineman, $2,497; 2. Cole Echols, 89, $1,892; 3. Joe Frost, 82, $1,589; 4. Brennon Eldred, 80, $908. Average: 1. Tim Bingham, 180.5 points on two rides, $5,675; 2. Cole Echols, 176.5, $4,351; 3. Brennon Eldred, 167.5, $3,216; 4. Joe Frost, 151, $2,081; 5. Chris Roundy, 89 points on one ride, $1,324; 6. J.W. Harris, 85, $945; 7. (tie) Corey Navarre and Jordan Spears, 82, $662 each.